Road Trip!!! We left south central Pennsylvania Sunday morning and traveled west to Reels Corner, PA. From here, we headed south on route 219 through western Maryland and into West Virginia. It was a lovely day with early warm fall temperatures and sunny skies. Our destination was Canaan Valley Resort where we were booked for the entire trip. The Lodge was updated and the Hickory Restaurant had excellent food and good service. 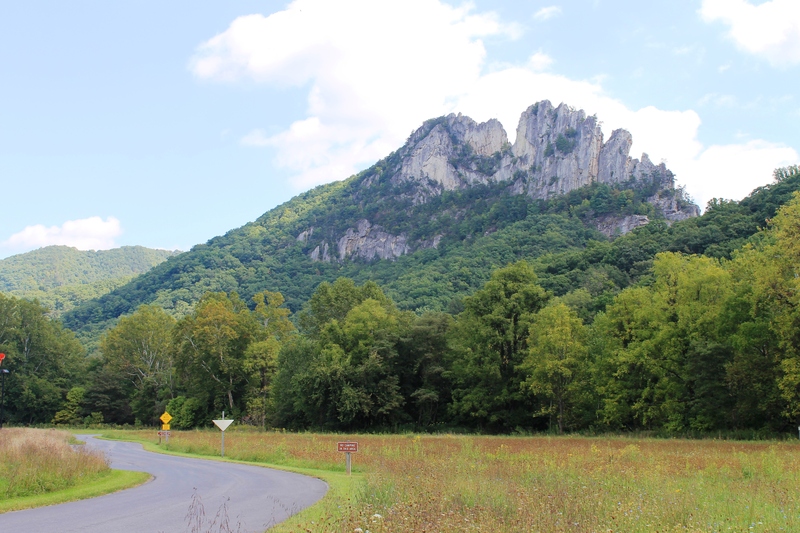 At Seneca Rocks, there is a Discovery Center (open 9AM to 4:30PM in September), a gift shop and an onsite homestead to tour. Of course, the big attraction is the towering rocks. The best photos were from the ground level, but there is a 3 mile RT shady hike for anyone who likes the outdoors. For parking go to the farthest lot for the hiking trail and restrooms. Also in the area are picnic tables, horseback riding, lovely streams and an open area for kids to play. Nearby was a lovely general store that we enjoyed. At 4,863 feet, Spruce Knob Mountain is the highest peak in West Virginia and the highest peak in the Allegheny Mountain Range. There is a narrow paved road about 15 miles long with switchbacks to the top parking area An observation tower is easily accessed from the parking area, but the best views are from the nearby Whispering Spruce Trail. From this short forest trail, there are open areas with wonderful views from all vantage points. There were lovely early fall colors already in mid-September. By continuing past Spruce Knob on a 6 mile rugged gravel road, you reach Spruce Lake. Here at the lake, the fall colors were very evident. There was a boardwalk trail around the lake and canoeing and kayaking seemed to be popular on the calm waters of Spruce Lake. The Spruce Knob area is a worthwhile day trip for spectacular views of the WV mountains. The access to Blackwater Falls is found at the trading post parking lot. After the trip down 214 stairs you arrive at the lower observation platform where there are good photo opportunities of Blackwater Falls. 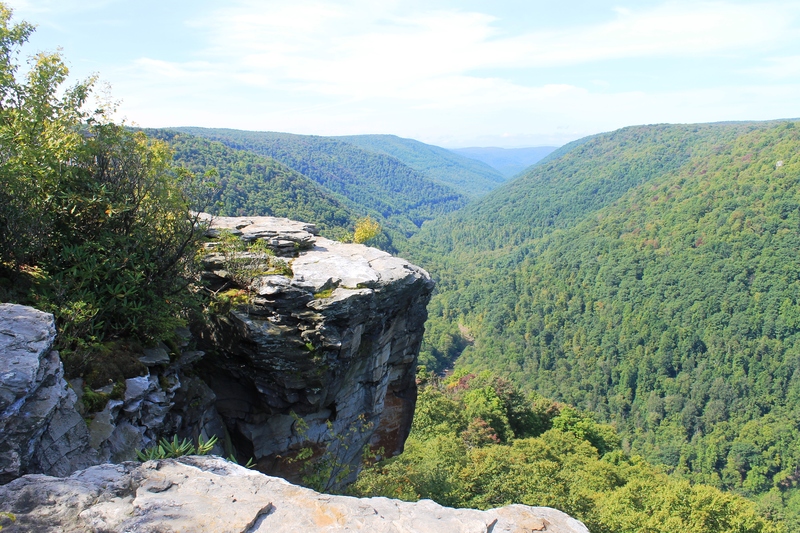 The surrounding canyon and Blackwater Falls are one of West Virginia’s best natural attractions in any season. We were told that in a few weeks there would be throngs of visitors at every attraction. On this beautiful pre-fall day, we had the place to ourselves. 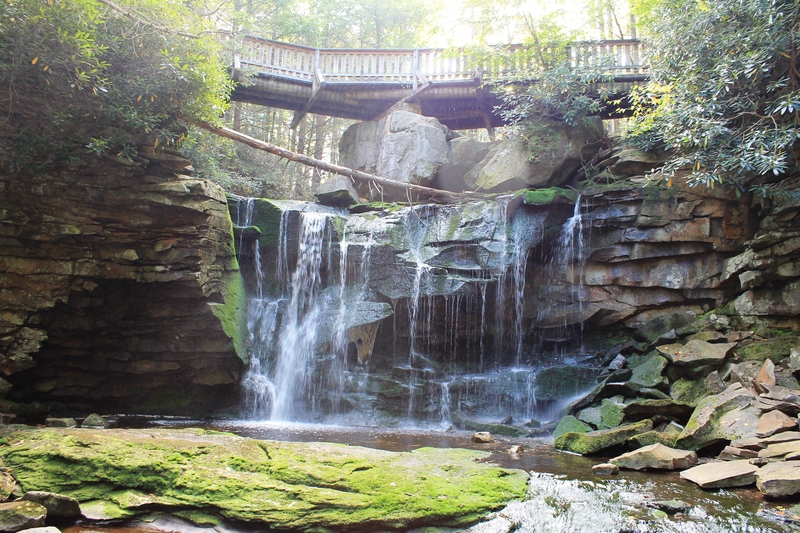 On the south side of Blackwater Falls Lodge is a one-half mil trail to Elakala Falls. You cross over a bridge to look down over the falls. 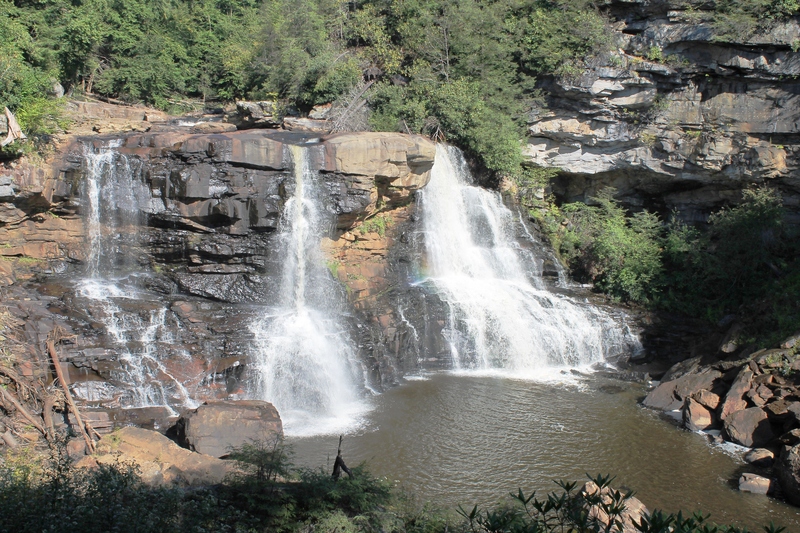 Elakala Falls is not as large as Blackwater Falls, but is very picturesque. To get to base of the falls requires a steep climb down a tricky ravine. We tread carefully and managed to accomplish the task! At the base, the photo opportunities were much better. 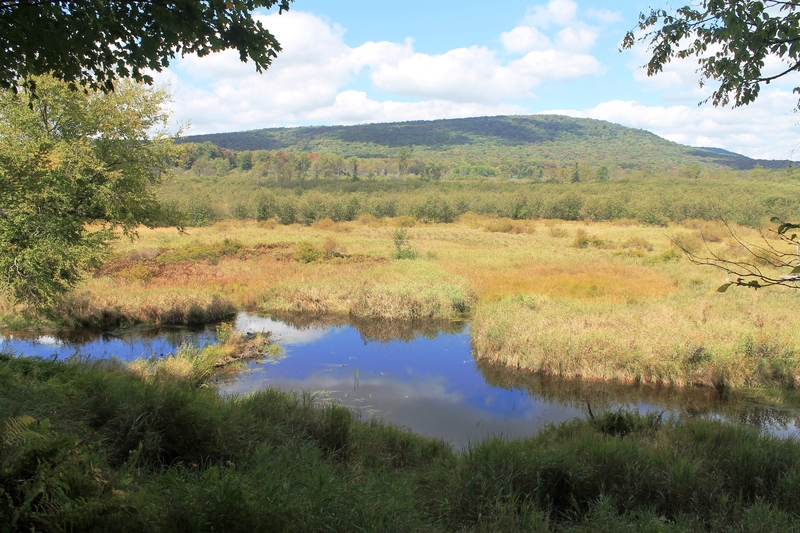 We had a little extra time one day, so we looked over the trail map of the Canaan Valley State Park area. We decided to try the Blackwater River Trail. This trail begins from the parking lot at the Canaan Valley Golf Course. The trail is an easy 1 mile round trip through the forest and along the Blackwater River. The forest area was lovely with fascinating forest undergrowth and teeny-tiny frogs hopping through the long grasses. Along the photogenic river were open areas that provided easy opportunities for taking pictures. The river is also a popular area for fishing enthusiasts. The trail for Lindy Point is located in the far end of Blackwater State Park , past the main lodge and cabins and there is parking at the trail head. The trail is a level one mile round trip hike with a great reward! Hiking the trail to Lindy Point was one of those experiences that I like to freeze in my mind for instant recall when I need a nature fix. The clean mountain air was so refreshing! When you reach Lindy Point, there are beautiful far-reaching views with multiple shades of green and some early fall colors. We enjoyed the entire trip to the Canaan Valley and Blackwater Falls Parks and Lindy Point was our favorite area.